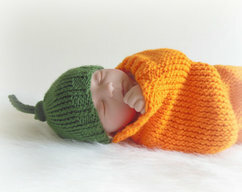 Knit infant cocoon. Made with acrylic yarn. Wash on normal cycle & dry on low heat. Cocoon measures approximately 18 1/2in long & 16in in circumference. This makes a great photo prop, baby gift, or just a great item to keep that little one snug & warm! Cocoons can be done in one solid color, stripes, or body in one color with the trim in another. It is your choice of design, just leave a note in the "Note from Buyer" box letting me know what you desire. If you would like a matching cocoon, please find our cocoon listing in the "create a custom item" section of our shop.